One of the (many) things that bothers me about politicians establishing the rules under which public education must operate is the random manner in which they create them. It would be one thing if they based their demands on scientific research about child development, but they don’t. Instead, they pass laws dictated by their personal and political preferences, which often are diametrically opposed to what we know to be true about how people achieve success. This “fly by the seat of their pants” approach to policy development explains why they have failed miserably over the last two decades in crafting solutions that they claim will help unsuccessful children become successful. I have lost track of the number of times politicians have forced educators, often against our will, to comply with foolish mandates that we knew couldn’t work. They usually implement them under threat of repercussions if we choose to ignore them, only to come back a couple of years later and change their expectations. It is a never-ending cycle that defies logic. They do this as if it is a sport with no regard to how difficult it is for people to have to focus on a different target every year and with little care for the monetary or human capital waste their mandates cause, and they are expensive in every sense of the word. A perfect example of the kinds of inane conversations surrounding educational policy development in Columbus occurred this summer in conjunction with the law known as “The Third Grade Reading Guarantee.” This law is so poorly conceived by its sponsor, Sen.Peggy Lehner, that it tries to address childhood literacy while completely ignoring the time in a child’s life during which the foundation for literacy is established, which we know is the time from birth to age 5. But, setting aside that mild little oversight, it seems that Sen. Lehner felt it would be a good idea to retain any third grader who couldn’t achieve a randomly selected score on a state reading test, despite what the research tells us about the harmful effect retaining students typically has on them. But, as usual, the research be damned; it was full speed ahead. So, as if deciding that the success of students who are 8 and 9 years old should hinge on their performance on a test isn’t crazy enough, the law dictates that the “passing” score should be increased each year until it reaches the magical number of 700. Again, there is no basis in research in this decision, but 700 it is! And, this brings us to the discussion that occurred among state board of education members this summer, during which they debated what the new “cut” (aka passing) score should be this year. Fortunately, the board in its entirety did not adopt her more assertive stance and the cut score was increased more modestly than Dr. Morgan had hoped for. But, that is really not the point. The point is that Dr. Morgan viewed this discussion in terms of what it would do to “the system” whatever that is, and that is alarming. Policymakers are so hell-bent on fixing “the system” that they forget children are affected by their foolish decisions. To be clear, in this case the focus should only be on what their decisions do to a bunch of 8- and 9-year-old kids, and that is ALL that should matter. Additionally, the fact that the board settled on a score that was less than the assertive stance Dr. Morgan desired proves my point of how randomly these kinds of important decisions are made at the state level. There was no research-based reason for Dr. Morgan’s assertiveness. She just thought we should give it a try, just as, I’m sure, there was no valid reason for the board to adopt a less assertive stance. But a number was chosen. Which means that once again, a policy decision important enough to determine a young child’s future was made by a group of people in a room in Columbus based on their personal whims, not on valid research. 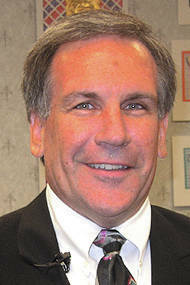 Tom Dunn is the superintendent of the Miami County Educational Service Center.